As part of her blog tour for her newly released title, Making Spaces, the author has kindly written a short essay entitled ‘Writing about your twenties in your thirties’. I love that the author has clearly put a lot of herself into her main character, Miriam. As a woman in her miiiiiid….late…. twenties, it’s nice to hear from someone with such a wonderful way with words that life really does get its sh*t together! 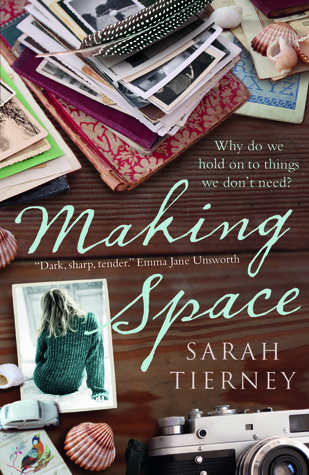 Sarah Tierney completed the Novel Writing MA at Manchester University in 2001 and will have her first novel, Making Space, published in 2017. She can’t really account for the 16 years in-between except to say she did a bit of journalism, a lot of copywriting, and somewhere in there, wrote a short story, ‘Five Miles Out’, which was made into a short film by the director Andrew Haigh. She spent her twenties in Manchester before moving back to her home town of Glossop, where she lives with her husband and daughter. Miriam, the narrator in my novel Making Space, is about to turn 30. She’s ending her twenties without achieving any of those life goals you’re supposed to get sorted in that decade: a long-term partner, a steady career, a decent place to live. Instead, her jobs are as temporary as her relationships. And her home – a tiny flat she shares with a friend she’s fallen out with – feels distinctly un-homely. She’s ready to leave those years of flux and instability behind, but she doesn’t know how to create something more lasting. The only permanent thing in her life is an unshifting feeling of failure. In two months’ time, I’ll turn 40. But unlike the big Three-O, the approach of this milestone birthday isn’t beset by a sense of gloom. My life is much more stable than it was ten years ago. It has been for a while. It’s one reason I finally managed to finish a book. I tried writing a novel when I was in my twenties but something always got in the way. A hangover usually, or a heartbreak, or a sudden influx of freelance work that ate up all my time. I’d re-emerge from those fugue states having lost all connection to my writing. I’d open up my manuscript and wonder who the characters were, and what it was I was trying to say. And when I was in my twenties, the need for recognition – for a pat on the back from the rest of the world – was strong. I went into journalism and copywriting for the satisfaction of finishing a piece of writing in a day, and having an audience, and getting a pay-check. When you’re writing a novel, you don’t have those things. You sit on your own in a room for hours, weeks, years, with nobody cheering you on and the end nowhere in sight. Most people you know assume that ‘writing a book’ is your excuse for not having a full-time job, or your way of avoiding the challenges of an adult life. If you want to feel successful, writing a novel is probably the last thing you should do. So, for a lot of those years, it was the last thing I did. But by 35, I was leaving that stage behind. I cared less about what my life looked like from the outside, and more about how it felt to be living it. When I started writing Making Space, I was newly-single and living alone in a flat that got the sun in the mornings. I had a steady part-time job, and an emotional life that wasn’t constantly freewheeling between highs and lows. Life was quiet but I was fine with that. I liked it. I was ready to begin. I had my writing schedule, based on time spent at my computer rather than a word count. And without all the dramas and distractions I’d had in my twenties, I was able to stick to it. I gradually watched a few chapters grow into a full-length novel. And what I found was that my fixed writing schedule – that guaranteed time spent at my desk in my own little fictional world – gave me the peacefulness and permanence I’d been craving all those years and hadn’t been able to find. I wish I’d known it could be like that when I was younger. That if you can just keep your writing going by doing it regularly – even if only for an hour, a few set times a week – you’ll always have something fixed and stable to return to, no matter what chaos is unfolding in the rest of your life. And from those few hours a week, something permanent will take root: a solid sense of accomplishment, or a book, or hopefully, both.